It is sure that all of us are aware of Fruit Ninjas. They are real and we’ve seen them in their civilian clothes practicing on the train, bus and in bars. Now, Fruit Ninja for iPhone iOS and Android phones is one of the most downloaded games of all time. We can say it is one step further than the Smartphone game and few steps away from going full full Tarantino in the greengrocers, these adorable characters can be hugged, squeezed, cuddled and occasionally lobbed into the air and tonked with a stick. The size of this character is 5 inches and compact with your bedside, car, desk and even with your pocket. You can choose from from the familiar bomb, apple, pineapple or strawberry. 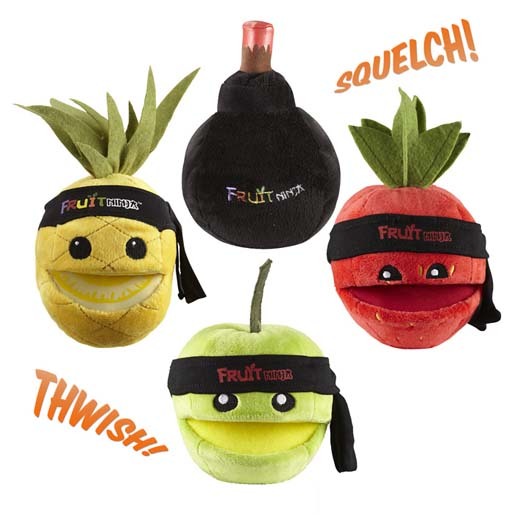 Fully licensed by the masterful chaps behind Fruit Ninja, these squishable icons even feature the game’s signature sound effects. So you can enjoy that familiar ‘splat’ as you practice the ancient art of kung-fruit. Each of these features ‘splat’ sound effect and they’re based on the top-selling digital app, Fruit Ninja.